John left America and set out in his sailboat on a three-year journey around the world, eventually settling in London. Now, ten years later, he has come home to the Gold Coast, that stretch of land on the North Shore of Long Island that once held the greatest concentration of wealth and power in America, to attend the imminent funeral of an old family servant. Taking up temporary residence in the gatehouse of Stanhope Hall, John finds himself living only a quarter of a mile from Susan, his aristocratic ex-wife, who has also returned to Long Island. But Susan isn't the only person from John's past who has reemerged: Though Frank Bellarosa, infamous Mafia don and Susan's ex-lover, is long dead, his son, Anthony, is alive and well, and intent on two missions: Drawing John back into the violent world of the Bellarosa family, and exacting revenge on his father's murderer--Susan Sutter. At the same time, John and Susan's mutual attraction resurfaces and old passions begin to reignite, and John finds himself pulled deeper into a familiar web of seduction and betrayal. 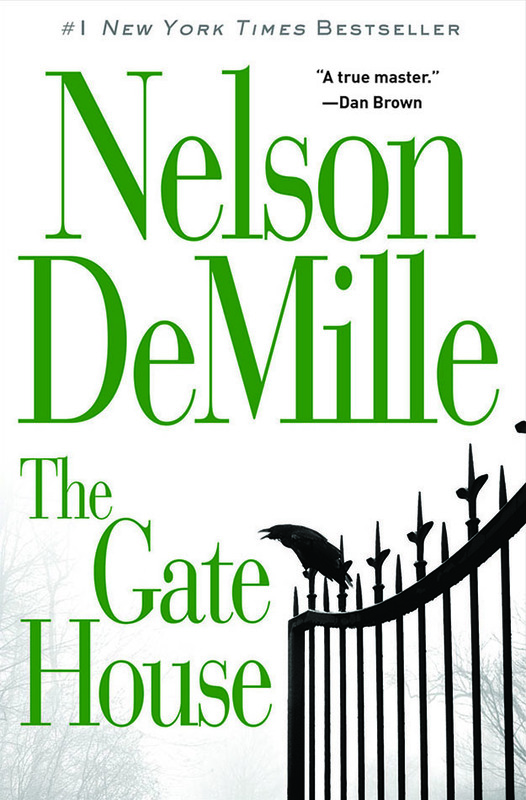 In The Gate House, acclaimed author Nelson DeMille brings us back to that fabled spot on the North Shore -- a place where past, present, and future collides with often unexpected results. It is a warm summer evening, and by the light of a full white moon, I, John Whitman Sutter, am watching my wife, Susan Stanhope Sutter, as she rides her horse Zanzibar across the quiet acres of Stanhope Hall, her ancestral estate. The rising moon is eerily bright, and it illuminates the landscape with an unearthly glow, which transforms all color into silvery shades of blue and white. Susan passes through a line of tall pines and enters a neighboring estate called Alhambra, and I wonder why she has trespassed on this property, and I hope she has gotten permission from Alhambra’s new owner, a Mafia don named Frank Bellarosa. Majestic trees cast long moon shadows over the grassy fields, and in the distance I can see the huge stucco villa which is dark, except for a light from the closed glass doors of a second-story balcony. That balcony, I know, leads to the library where Frank Bellarosa sits in his leather armchair. Susan draws near to the house, then dismounts and tethers Zanzibar to a tree. She walks to the edge of a long marble reflecting pool set in a classical garden of mock Roman ruins. At the far end of the pool is a statue of Neptune, holding aloft his trident, and at his feet, stone fish spout water from their gaping mouths into a large alabaster seashell, which overflows into the pool. At the opposite end of the pool, closest to me, is a statue of the Virgin Mary, which is new, and which I know was put there by Bellarosa's wife as a counterbalance to the half-naked pagan god. A soft, balmy breeze moves the cypress trees, and night birds begin their song. It is a beautiful evening, and Susan seems entranced by the moonlight and the enchanted garden. I, too, am mesmerized by this magical evening. As I turn my attention back to Susan, she begins to take off her clothes, and she drapes each piece over the statue of the Virgin, which surprises and bothers me. Susan moves to the edge of the pool, her red hair billowing in the breeze, and she is gazing down at her naked reflection in the water. I want to take off my clothes and join her, but I notice that the light from the library has gone out, and the doors of the balcony are now open, though no one is there, and this gives me an uneasy feeling, so I stay where I am in the shadows. Then I see a man silhouetted against the white walls of Alhambra, and he is moving in long, powerful strides toward the pool. As he comes closer, I see that it is Bellarosa, and he is wearing a black robe. He is now standing beside Neptune, and his face looks unnatural in the moonlight. I want to call out to Susan, but I can't. Susan does not seem to see him, and she continues to stare down at her reflection, but Bellarosa’s stare is fixed on Susan. I am incensed that this man is looking at my wife's naked body. This scene stays frozen, Susan and Frank as motionless as the statues beside them, and I, too, am frozen, powerless to intervene, though I need to protect Susan. Then I see that she has become aware of Bellarosa's presence, but she does not react. I don't understand this; she should not be standing naked in front of this man. I'm angry at her, and at him, and a stream of rage races through my mind, but I can't put this rage into words or sounds. As I stare at Susan, she turns her back to the pool, and to Bellarosa, and I think she is going to leave. Then, she turns her head in my direction, as though she's heard a sound. I make a move toward her, but suddenly she lifts her arms and springs backward into the pool, and in long, powerful strides, she moves naked through the moonlit water toward Frank Bellarosa. I look at him, and I see that he is now naked, standing with his arms folded across his chest. He is a large, powerfully-built man, and in the moonlight he appears as imposing and menacing as the naked stone god beside him. I want to shout out to Susan, to warn her to come back, but something tells me to stay silent – to see what happens. Susan reaches the far end of the pool and lifts herself into the water-filled seashell, where she stands near the towering statue of Neptune. She is looking up at Bellarosa, who has not moved from the edge of the pool, except to turn his face toward her. They stare at each other, unnaturally motionless, then Bellarosa steps into the shallow water of the seashell where he stands in front of Susan. They are speaking, but all I can hear is the rushing sound of the spouting water. I am enraged at this scene, but I still can't believe that Susan wants to be there, and I wait for her to dive back into the pool and swim away from him. Yet, the longer she remains standing naked in front of him, the more I realize that she has come here to meet him. As I let go of any hope that Susan will dive back into the pool and swim away, she kneels into the shallow water, then moves her face into Bellarosa's groin and takes him into her mouth. Her hands grasp his buttocks and pull him closer to her face. I close my eyes, and when I open them again, Susan is lying on her back in the scalloped seashell, her legs are spread wide and they dangle over the edge of the waterfall, and Bellarosa is now standing in the reflecting pool, and he buries his face between her thighs. Then, suddenly, he pulls Susan’s legs up so they rest on his shoulders, and he seems to rise out of the water as he enters her with a powerful thrust that forces a deep cry from her lips. He continues his rough thrusts into her until she screams so loudly it startles me. "Mr. Sutter! Mr. Sutter! Sir, we are descending. Please fasten your seatbelt." "We're descending,” a female voice said. “You need to fasten your seatbelt and put your seat in the full upright position." I never asked Susan how, when, and where she began her affair with Frank Bellarosa – this is not the sort of information one needs to hear in any detail – but it was something that remained missing from what I did know. So, my shrink, if I had one, would say that my dream was an unconscious attempt to fill in this lacuna – the missing piece of the affair. Not that it mattered a decade after I divorced her. In legal terms, I charged adultery, and she admitted to it. The state did not require any juicy details or explicit testimony, so neither should I. The British Airways flight from London to New York crossed over the Long Island Sound, descending toward John F. Kennedy International Airport. It was a sunny day, a little after 4:00 p.m., Monday, May 27, and I remembered that today was Memorial Day in America. Below, on the North Shore of Long Island, I could see a place called the Gold Coast, where I used to live, ten years ago. Probably, if I looked hard enough, I could see the large neighboring estates called Stanhope Hall, and what was once Alhambra. I now live in London, and the purpose of my return to America is to see an old lady who is dying, or who may well have died during my seven-hour flight. If so, I’d be in time for the funeral, where I’d see Susan Stanhope Sutter. The presence of death in the coffin should compel us into some profound thoughts about the shortness of life, and make us rethink our many disappointments, resentments, and betrayals that we can’t seem to let go of. Unfortunately, however, we usually take these things to the grave with us, or to the grave of the person we couldn’t forgive in life. But now and then, we do find it in our hearts to forgive, and it costs nothing to do that, except some loss of pride. And maybe that was the problem. I was sitting on the starboard side of the business class cabin, and all heads were turned toward the windows, focused on the skyline of Manhattan. It's truly an awesome sight from three or four thousand feet, but as of about nine months ago, the main attraction for people who knew the city was the missing part of the skyline. The last time I'd flown into New York, a few weeks after 9/11, the smoke was still rising from the rubble. This time, I didn't want to look, but the man next to me said, "That's where the Towers were. To the left." He pointed in front of my face. "There." I replied, "I know," and picked up a magazine. Most of the people I still knew here in New York have told me that 9/11 made them rethink their lives and put things into perspective. That’s a good plan for the future, but it doesn’t change the past. The British Airways flight began its final descent into Kennedy, and a few minutes later we touched down. Soon, I'd be in a rental car on my way back to the place I once called home, but which was now a place that time had partly eroded from my mind, washing away too many of the good memories and leaving behind the hard, jagged edges of the aforementioned disappointments, resentments, and betrayals. The aircraft decelerated, then rolled out onto the taxiway toward the terminal. Now that I was here, and would remain here until the funeral, perhaps I should use the time to try to reconcile the past with the present – then maybe I’d have better dreams on my return flight.